Search to find the UK's smartest school. In this first-round heat, Seaside take on Liff. Who will make it through to the quarter-finals? 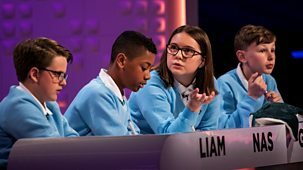 In this semi-final, Seaside Primary from West Sussex take on Stanley Primary from Middlesex. Will one of them go on to be Top Class? 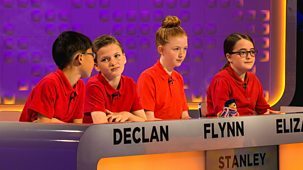 In this first semi-final, Cardwell Primary take on Overchurch. Who will make it through to the final? 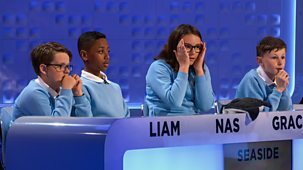 In this quarter-final, Seaside Primary from West Sussex take on The Queen's School from Cheshire. Will one of them go on to be Top Class? In this quarter-final Overchurch take on Cedar Park. Who will make it through to the semi-finals? In this first quarter-final Hamilton College take on Cardwell. Who will make it through to the semi-finals? In this first heat Stanley Primary take on South Morningside. Who will make it through to the quarter-finals? In this first-round heat, Hordle take on Overchurch. Who will make it through to the quarter-finals? Search to find the Uk's smartest school. In this first-round heat, Hamilton College take on Chalfont. Who will make it through to the quarter-finals? 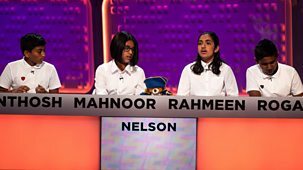 In this first-round heat Nelson Primary from London take on The Queen's School from Cheshire. Who will make it through to the quarter finals? In this first round heat Valley Gardens take on Cedar Park. Who will make it through to the quarter finals? 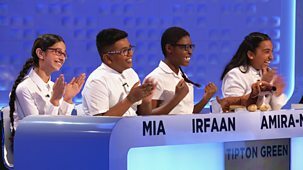 Search to find the Uk's smartest school. In this first round heat, Seaside take on Liff. Who will make it through to the quarter finals?